Craftsmen from the region will present ancient and contemporary techniques during the fair of the Thracian crafts. The Thracian legends will be presented through the attractive spectacle “The new Thracian”. Legends and natural elements will become alive through ancient rituals, music, dance and fire. 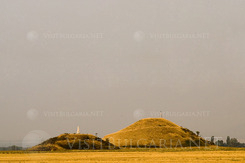 Photographers will present their art interpretation of the nature and culture resources of Kazanlak. Horseback riding, archery and traditional rituals will be demonstrated by boys and girls from “Bagatur”. The event will be held in park Rosarium. Guests of the event will be able to see an open air exhibition of young talented painters. The festival will be accompanied by an open air rock, metal, jazz and pop concert. The youngest guests of the event will be entertain with an attractive children animation. The festival will be held with the support of operation program “Regional development”. Its second edition is planed for the beginning of the summer season in 2013.